Four and twenty marvelous tales, one for each hour of the day," retold in a novel and entertaining manner by a master of the form. 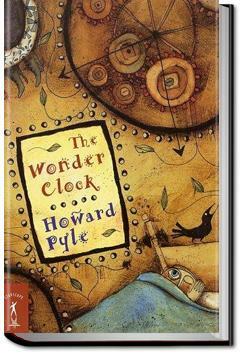 While drawing on German, English, and Scandinavian folk literature for many of his characters and plots, Pyle reworks the material in an imaginative way, crafting the tales in his own inimitable style. Equally engaging are the numerous woodcuts that accompany the stories and enliven the narrative. Honestly, I didn't like most of the stories. Some were okay though. My favorite was story #3. How One Turned His Trouble to Some Account. "Trouble" was an actual human character in this story. To be honest, I haven't read this outloud to the kids yet. I bought it and read it and really liked it. I do plan on using it but I think we'll do that when they're a bit older. Right now we're focusing on the more common fairy tales like Cinderella and Rapunzel and such. This book has been in my family for four generations, the 1912 edition having been given to my father by his grandmother in 1948.